Cardinal fans are well aware of the numbers that represent the success of the Boone Central girls basketball team’s breakthrough 2008-09 season – 21-3 and 1. Of course, 21-3 was the sterling record posted by the Lady Cardinals this past season. One represents a season of firsts for the program – first Mid-State Conference championship, first district tournament championship, first state basketball appearance (since the Albion/Petersburg merger). Statistical numbers from the ‘08-09 campaign back up the dominance of the BC girls, as well. While winning 21 games, Boone Central outscored opponents 1392-937, a per game average of 58-39. 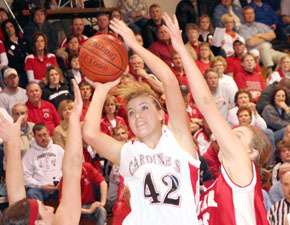 The Lady Cardinals topped opponents in nearly every significant team category this past season. Boone Central shot 45 percent from two-point range and 34 percent beyond the three-point arc while holding foes to 38 percent two-point shooting and just 22 percent accuracy behind the line. The only shooting stat that was close was at the free throw line, where the Cards held a slim 54 percent to 53 percent edge. They did shoot 79 more foul shots than their opponents, however, and made 46 more. The Lady Cardinals outrebounded their competition 802-665 (33.4-27.7 per game) and more than doubled the assists of their foes (360-166). Boone Central made 347 steals (14.5 per game) while forcing 564 turnovers (23.5 per contest). The Cards took good care of the basketball, committing just 16.4 turnovers per game. BC had a 93-74 advantage in blocked shots. Two Cardinals averaged double figures in scoring to lead a balanced Boone Central attack. Senior Stephanie Paulson scored 10.8 points per game and sophomore Bobbi Beckwith averaged 10 per contest. Paulson also led BC rebounders with 5.9 per game and Beckwith topped steals with 2.9 per outing. Senior Brittany Luettel led assists with 3.8 per contest. Points (per game): Paulson 10.8, Beckwith 10.0, Luettel 7.9, Julia Temme 7.8, Cara Struebing 6.3, Emily Wells 5.2, Erica Carder 4.6. Rebounds (per game): Paulson 5.9, Luettel 5.0, Wells 4.2, Struebing 3.9, Beckwith 3.8. Assists (per game): Luettel 3.8, Beckwith 2.7, Paulson 1.8, Wells 1.5, J. Temme 1.4, Struebing 1.1. Steals (per game): Beckwith 2.9, Luettel 2.3, Paulson 1.8, Wells 1.5, J. Temme 1.5, Paige Kolm 1.3, Carder 1.0, Struebing 1..0. Blocked shots: Paulson 20, Luettel 20, Wells 16, Struebing 11. Two-point field goal percentage: Paulson (51%), Struebing (50%), Wells (47%), Beckwith (45%), Luettel (44%), Lindsay Temme (43%). Three-point percentage: Marissa Koch (42%), J. Temme (39%), Beckwith (36%), Luettel (36%). Three-point field goals made: J. Temme 43, Beckwith 31, Carder 25, Luettel 18. Free throw percentage: Beckwith (71%), Carder (65%), J. Temme (65%), Wells (63%), Struebing (58%), Luettel (52%). Games played: 24 (Beckwith, Kolm, J. Temme, Struebing, Paulson, Luettel, Wells, L. Temme).